“A new chart released this week shows that the New York City taxi cab is not only an endangered species but that its days are numbered. Today, there are 65 percent more ride-hailing trips than taxi trips in New York City (see chart above). Genius employee and data-visual enthusiast Todd Schneider pulled from the reams of data released by the New York City Taxi & Limousine Commission each month that shows fares by car type — taxi or ride-hailing service. His analysis shows the tide has turned: At the end of 2017, all monthly ride-hailing pickups (Uber, Lyft, Juno, Via, Gett) numbered 15 million, while taxi pickups numbered less than 10 million. 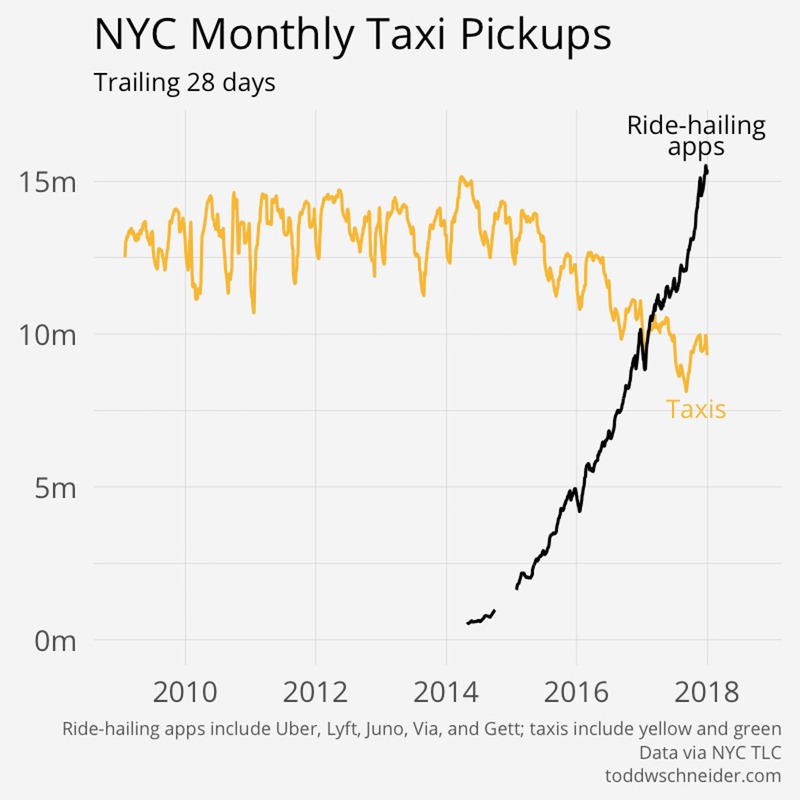 As use of yellow taxis (which primarily serve Manhattan) and green taxis (which primarily serve the other four boroughs) has been on the decline, there’s been a sharp increase in the use of ride-hailing apps.